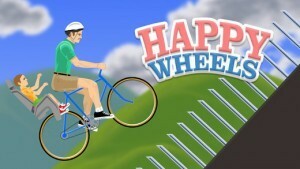 Happy Wheels is the latest sensational game for web browsers and advanced android phones. It involves manifestations of accidents impact on your chosen character. The game offers fragile transporting devices, from a wheelchair to a bike, with which you are to prevent accident occurrence. Come and play the colorful game of happy wheels. The special design will make you interested in it and the sounds are also nice. This is a game for free for every game lover who likes to be the part of it and earn as much scores as possible. The beginners are recommended to get familiar with the main instructions and get started. Before the play starts you can find the demo play and get know how to move and act in order to succeed. You are free to change or modify the main hero of the play, such as: select the outfit and the tools for the major movements. E.g. you can choose either bicycle or the wheels and get started. On your way you will see a lot of obstacles to be overcome; not so easy as it might seem at the beginning but worth enough to try and play. Gradually you are getting more skilled and the game makes more fun. Each time you fail you are given other chance to start again and stop the game when needed. The sounds are also accompanied and make feeling that you are the inseparable part of it. To throttle and maneuver around, utilize the arrow keys. To make a jump move, use the space tab while the letter Z is for ejection from the game. You can create secondary keys for the game. The terrains have many obstacles that you are to protect your character. Any obstacle you will hit will have some deteriorating effect on the player. The game has ten levels, which you unlock as you finish the set milestones. The obstacles become more complicated and with a higher impact as you go up the levels. You will start with two partners with whom you will compete to finish the milestone.